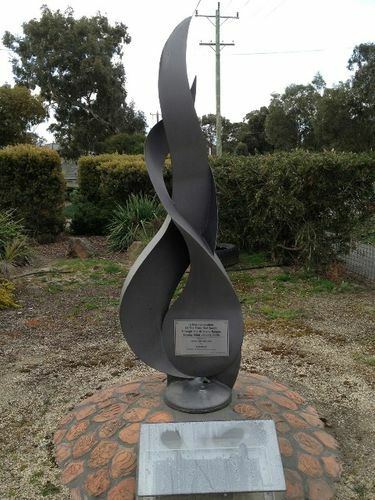 A monument commemorates the bushfires that swept through the Brisbane Ranges on the 22nd January 2006. January 2006 will go down in history as the month when lightning brought wildfire to one of the State's most loved parks. Despite lengthy efforts to control the fire from DSE, Parks Victoria and CFA fire fighters, flames engulfed more than 6700 hectares of National Park, public land and pasture land before finally being controlled on Tuesday 24 January 2006. The fire threatened the town of Anakie and more than 40 percent of the National Park was destroyed. The sculpture depicts a flame. Children from Anakie Primary School created tiles representing what the fire meant to them. The one hundred year old sewing machine is enclosed in a burnt National Park sign recovered from Anakie Gorge. The sewing machine was one of the few things remaining at the property of Mrs Kath Bourne of Staughton Vale, who lost her home. Grass trees were planted in recognition of the many native plants that were burnt. In spring 2006, the regenerated grass trees provided a brilliant display through the areas devasted by fire.